This stylish pillow is available in a variety of vibrant colors, you can easily find the perfect color to match or complement your sofa or loveseat. CUSHION COVER ONLY, NO PILLOW INSERT. Machine washable. It is recommended that all types of pillow covers be laundered periodically since they are the part that is in contact with a person's body. 1> The real item you will receive may be slightly different to the listed pictures due to fabric design repeat or different environment to take the pictures. 2> The size with bigger or smaller 5% is permitted due to the hand controlled measurement, cut and sewing. 3> Jepeak(TM) is a registered trademark and the only authorized seller of Jepeak branded products. 4> Jepeak provide you various kinds of great products at the lowest possible prices, welcome to our store and get what you want !!! 5> Jepeak highly appriciate all customers' opinions to improve the selling ,also if anything you unsatisfied, pls contact our customer service department for probable best solution. 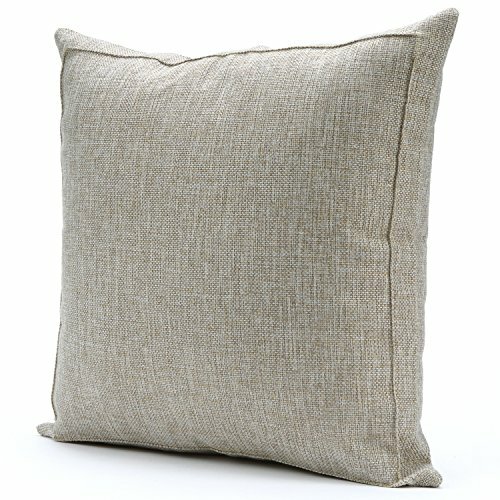 【HIGH QUALITY LINEN FABRIC】: This throw pillow case is made of thick burlap linen material, moisture permeability, breathable, easy cleaning without pilling. Good choice for home decorating collocation (simple & durable, have a little natural linen odor). NOTE: beige with khaki threads color similar to light flax grey color. 【EXQUISITE WORKMANSHIP】: This throw pillow cover is made with four lines of dense seam inside workmanship, there is no excess thread residue. The burlap linen fabric have a little stiff in first use, but would soften after washing (not fade). 【STYLISH FOR HOME DECORATE】: With our removable throw pillow cover you can change the decor of your room without throwing out your expensive and comfortable accent pillows or cushions. By decorating your home with these covers, you will receive a lot of compliments from your family. 【INDOOR & OUTDOOR USE】: Throw our cushion cover with pillows on your sofa, garden chairs, living room, bedroom ,office and everyday use, It is comfortable enough for you to enjoying happy time. Perfectly fit for 19" x 19" / 20" x 20" / 21" x 21" square pillow insert. Warm tip: only pillow case, pillow insert is not included. 【SATISFACTION GUARANTEED & CARE】: Jepeak offers you 100% free replacement and full refund. Machine wash in cold; Dries quick on tumble dry low; No bleach; Cool iron. Can also be dry cleaned. View More In Throw Pillow Covers. If you have any questions about this product by Jepeak, contact us by completing and submitting the form below. If you are looking for a specif part number, please include it with your message.